Almighty ever-living God, who, while the Blessed Virgin Mary was carrying your Son in her womb, inspired her to visit Elizabeth, grant us, we pray, that, faithful to the promptings of the Spirit, we may magnify your greatness with the Virgin Mary at all times. Through our Lord Jesus Christ, your Son, who lives and reigns with you in the unity of the Holy Spirit, one God, for ever and ever. The feast of the Visitation recalls to us the following great truths and events: The visit of the Blessed Virgin Mary to her cousin Elizabeth shortly after the Annunciation; the cleansing of John the Baptist from original sin in the womb of his mother at the words of Our Lady's greeting; Elizabeth's proclaiming of Mary—under the inspiration of the Holy Ghost—as Mother of God and "blessed among women"; Mary's singing of the sublime hymn, Magnificat ("My soul doth magnify the Lord") which has become a part of the daily official prayer of the Church. The Visitation is frequently depicted in art, and was the central mystery of St. Francis de Sales' devotions. "My soul doth magnify the Lord, and my spirit hath rejoiced in God my Savior. Because he that is mighty, hath done great things to me, and holy is His name" (Lk. 1:46). This feast is of medieval origin, it was kept by the Franciscan Order before 1263, and soon its observance spread throughout the entire Church. Previously it was celebrated on July 2. Now it is celebrated between the solemnity of the Annunciation of the Lord and the birth of St. John the Baptist, in conformity with the Gospel accounts. Some places appropriately observe a celebration of the reality and sanctity of human life in the womb. The liturgical color is white. According to the 1962 Missal of St. John XXIII the Extraordinary Form of the Roman Rite, today is the feast of Corpus Christi. This feast in the Ordinary Form of the Roman Rite is celebrated on Sunday, June 7. Please see this special section on Corpus Christi. According to the 1962 Missal of St. John XXIII the Extraordinary Form of the Roman Rite, today is the feast of the Queenship of the Blessed Virgin Mary and St. Petronilla. The feast of the Queenship of Mary is now celebrated in the Ordinary Rite on August 22. Aurelia Petronilla was guided in the Faith by St. Peter, the first pope. She died three days after refusing to marry a pagan nobleman, Flaccus. There is no historic proof that she was martyred, but an early fresco clearly represents her as a martyr. Her feast is no longer on the calendar. How lyrical that is, the opening sentence of St. Luke's description of the Visitation. We can feel the rush of warmth and kindness, the sudden urgency of love that sent that girl hurrying over the hills. "Those days" in which she rose on that impulse were the days in which Christ was being formed in her, the impulse was his impulse. Many women, if they were expecting a child, would refuse to hurry over the hills on a visit of pure kindness. They would say they had a duty to themselves and to their unborn child which came before anything or anyone else. The Mother of God considered no such thing. Elizabeth was going to have a child, too, and although Mary's own child was God, she could not forget Elizabeth's need—almost incredible to us, but characteristic of her. She greeted her cousin Elizabeth, and at the sound of her voice, John quickened in his mother's womb and leapt for joy. I am come, said Christ, that they may have life and may have it more abundantly. [Jn. 10, 10] Even before He was born His presence gave life. With what piercing shoots of joy does this story of Christ unfold! First the conception of a child in a child's heart, and then this first salutation, an infant leaping for joy in his mother's womb, knowing the hidden Christ and leaping into life. How did Elizabeth herself know what had happened to Our Lady? What made her realize that this little cousin who was so familiar to her was the mother of her God? She knew it by the child within herself, by the quickening into life which was a leap of joy. If we practice this contemplation taught and shown to us by Our Lady, we will find that our experience is like hers. If Christ is growing in us, if we are at peace, recollected, because we know that however insignificant our life seems to be, from it He is forming Himself; if we go with eager wills, "in haste," to wherever our circumstances compel us, because we believe that He desires to be in that place, we shall find that we are driven more and more to act on the impulse of His love. And the answer we shall get from others to those impulses will be an awakening into life, or the leap into joy of the already wakened life within them. Patronage: St. Elizabeth: Expectant mothers. Symbols: St. Elizabeth or Elisabeth: Pregnant woman saluting the Virgin; Elderly woman holding St. John Baptist; huge rock with a doorway in it; in company with St. Zachary. St. Zacharias or Zachary: Priest's robes; thurible; altar; angel; lighted taper; Phyrgian helmet. 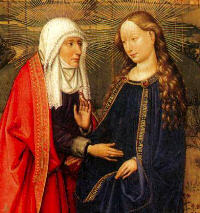 Read Luke 1:39-47, the story of the Visitation. Read and meditate on the words of the Magnificat and the Hail Mary, two prayers from this feast. For those with children, depending on the ages, assign memorization for these prayers. Also discuss the meaning of the text as a family. This feast reminds us to be charitable to our neighbors. Try to assist some mother (expectant or otherwise), visit the elderly or sick, make a dinner for someone, etc. It is probable that Aurelia Petronilla was of the imperial family of the Flavii. The early traditions of the Church speak of her as being the spiritual daughter of the Prince of the Apostles; and though she did not, like Domitilla, lay down her life for the faith, she did offer to Jesus that next richest gift, her virginity. The same venerable authorities tell us also that a Roman Patrician, by name Flaccus, having asked her in marriage, she requested three days for consideration, during which she confidently besought the aid of her divine Spouse. Flaccus presented himself on the third day, but found the palace in mourning, and her family busy in preparing the funeral obsequies of the young virgin, who had taken her flight to heaven, as a dove that is startled by an intruder's approach. In the eighth century, the holy Pope Paul I had the body of Petronilla taken from the cemetery of Domitilla, on the Ardeatine Way. Her relics were found in a marble sarcophagus, the lid of which was adorned, at each corner, with a dolphin. The Pope had them enshrined in a little church, which he built near the south side of the Vatican Basilica. This church was destroyed in the sixteenth century, in consequence of the alterations needed for the building of the new Basilica of St Peter; and the relics of St Petronilla were translated to one of its altars on the west side. It was but just that she should await her glorious resurrection under the shadow of the great Apostle who had initiated her in the faith, and prepared her for her eternal nuptials with the Lamb. Thy triumph, O Petronilla, is one of our Easter joys. We lovingly venerate thy blessed memory. Thou didst disdain the pleasures and honors of the world, and thy virginal name is one of the first on the list of the Church of Rome, which was thy mother. Aid her now by thy prayers. Protect those who seek thine intercession, and teach us how to celebrate, with holy enthusiasm, the solemnities that are soon to gladden us. Patron: against fever; dauphins of France; mountain travellers; treaties between Popes and Frankish emperors. Symbols: Keys; broom and closed book; crown of roses; dolphin. Often portrayed as: Being healed by Saint Peter; early Christian maiden with a broom; holding a set of keys; lying dead but incorrupt in her coffin with flowers in her hair; receiving the newly dead into heaven; spurning a marriage proposal, with a ring being offered by a king; standing with Saint Peter; woman with a dolphin.